use coupon code “TMN241” to buy one ticket & get one free to select performances of Ringling Bros. and Barnum & Bailey’s Circus Xtreme. The deal is available for select tickets to the 7:30 performances on February 15 & 16, the 10:40 a.m. performance on February 17, and the 11:00 a.m. & 3:00 p.m. performances on February 20, 2017. Use code “GASSOUTH” saves you a bit on select tickets to most performances of Ringling Bros. and Barnum & Bailey’s Circus Xtreme. Reading with Ringling program, your kid can read to score a free kid’s ticket to Ringling Bros. and Barnum & Bailey’s Circus. If it works like 2016, you’ll need to purchase at least one adult ticket to get the deal, but you can bring up to three kids free per adult ticket purchased. If you have a child under age 1 that’s living in the continental U.S., you can get a free ticket that’s good for a future Ringling Bros. and Barnum & Bailey’s production, thanks to the Baby’s First Circus promo. You’ll need to apply for the free voucher, which will be sent by mail. The voucher never expires, so once it arrives, put it in a safe spot & save it to cash in a few years from now. 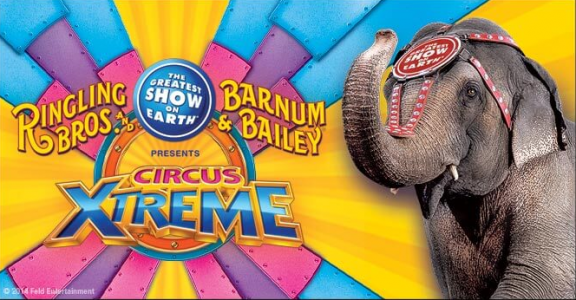 On opening night, you can get $15 tickets for Price Level 3 & 4 tickets to Ringling Bros. and Barnum & Bailey’s Circus Xtreme at Infinite Energy Arena, no coupon code required. The deal is valid for the 7:30 p.m. performance on February 23, 2017.